Professor Graeme Black, Honorary Consultant at Central Manchester University Hospitals NHS Foundation Trust (CMFT) and Professor in Genetics and Ophthalmology at The University of Manchester has been awarded the Order of the British Empire (OBE). Professor Black’s strategic leadership has been integral to developing Manchester’s infrastructure and research investment, including The Greater Manchester NHS Genomic Medicine Centre and numerous successful grants from NIHR, Wellcome Trust, Department of Health and national eye charities to fund further research. 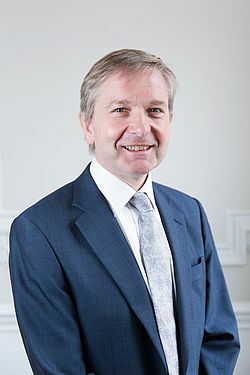 Throughout his career, Professor Black has sought to improve the diagnosis, management and treatment of rare genetic disorders associated with visual disability. Most recently, he has overseen a scientific team that provides genetic testing for inherited ophthalmic disease. Having introduced genetic testing for these conditions over the last decade, this can now produce a diagnosis in around 80% of children with retinal dystrophies. During training Prof. Black undertook at DPhil with Professor Ian Craig in the Department of Biochemistry at the University of Oxford, studying the genetics of X-linked inherited ophthalmic disease. It was this period that enabled him to develop his combined subspecialty interests. Having moved to Manchester in 1995 Graeme became a Wellcome Trust Clinician Scientist Fellow in 1997 and a Wellcome Trust Senior Research Fellow in 2002. This enabled him to focus on functional analyses of recently identified genes, defining their role in normal development as well as in the disorders studied. Graeme was the director of the NIHR Manchester Biomedical Research Centre (BRC), a specialist centre in Genetics and Developmental Medicine, from 2009-2012. Graeme lead the BRC to develop an impressive track record of translating scientific breakthroughs into clinical practice.2012-14 Graeme was the inaugural director of the Institute of Human Development, within the Faculty of Medical and Human Sciences at The University of Manchester helping to bring together research in the areas of genetic medicine, specialist senses, diabetes & endocrinology, maternal and fetal health and paediatrics. Graeme’s major research interest is the investigation of genetic disorders associated with visual disability. His overaching aims are to improve the diagnosis, management and treatment of such conditions. This work initially focused on the characterisation of genes and proteins underlying inherited developmental disorders such as anophthalmia, cataract and retinal degenerative disorders. However most recently Graeme has overseen a scientific team that provides genetic testing for inherited opthalmic disease. This includes retinoblastoma, the commonest ocular malignancy of childhood. Furthermore, through funding provided by the Department of Health and the British Retinitis Pigmentosa Society his team has developed a national genetic testing service for inherited retinal diseases. These include several forms of retinitis pigmentosa, cone-rod dystrophy as well as a number of macular dystrophies.